The beauty of bridges, across the country, are highlighted for all to enjoy. The architectural design is complicated by the location of the bridge and how it is to function. The masterful creation of the beauty of the bridge must also deal with safety and longevity. All of this type of information is given throughout the book. 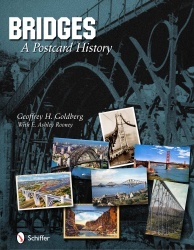 This 8 ½” x 11” hardback book with a dust cover enables you to fully understand all the aspects of the need for bridges in all of our lives. The 480 plus color photos along with black and white images on 208 pages will give you many hours of enjoyment. The book retails for $49.99.